Eight witnesses near the Mason Dixon Line reported delayed boom sounds a few moments after the fall. AMS Operations Manager Mike Hankey has been testing a new Raspberry PI based fireball camera system in his front yard for several months and this is certainly the best fireball video he has captured to date. The camera system is comprised of 6 cameras each pointing in a different direction. The light from the fireball was actually recorded on 5 of the 6 cameras. 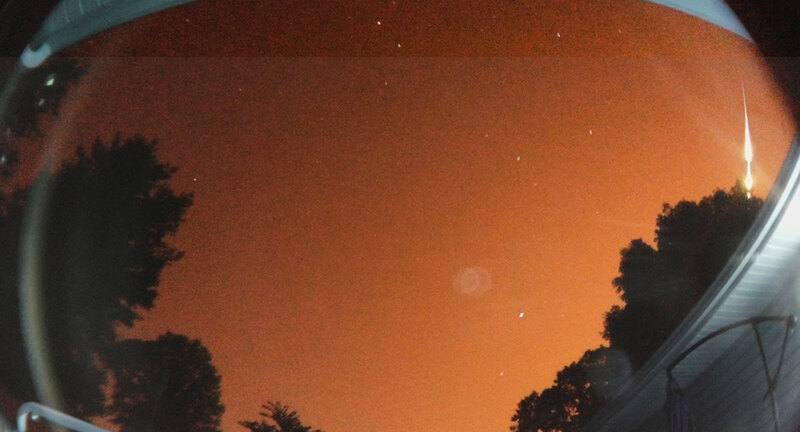 2 cameras with slightly overlapping fields of view directly caught the meteor. Aristidis Koutsouradis, another Rapsberry PI user from Westminster Maryland also caught a still picture of the fireball using his Raspberry PI Computer and wide angle lens. Several other videos surfaced after the event. 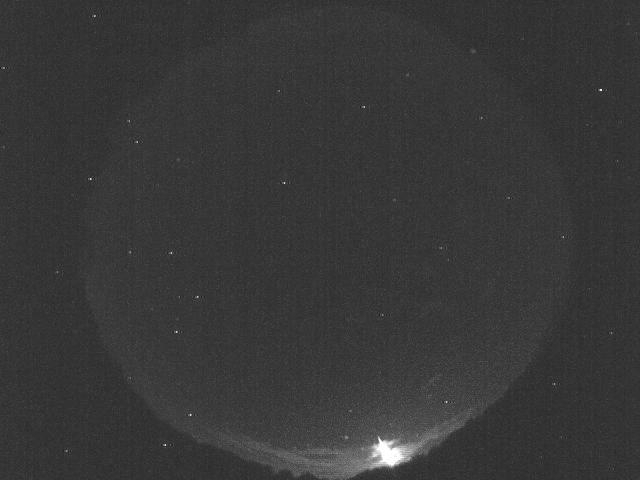 A Sentinel Sky Cam operated at Keystone College caught the fireball in the SSW. Charles Markarian caught the entire event on his dash cam from McAfee New Jersey. 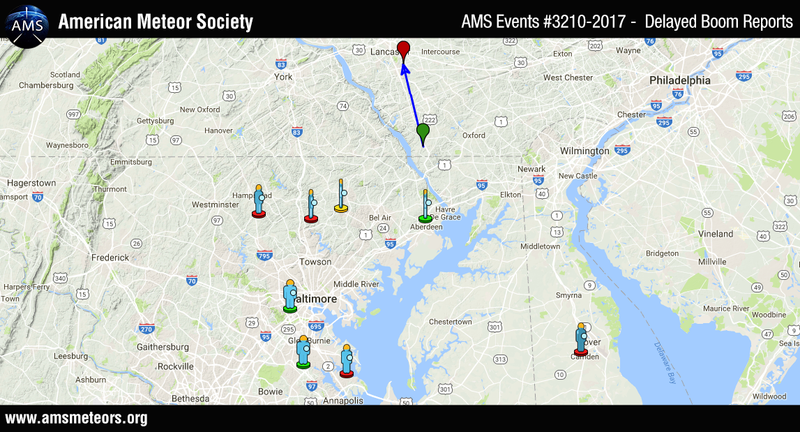 Based on the sonic boom reports, the magnitude of the meteor and the obvious visible fragmentation in the videos there is a good chance meteorites from this fall could have landed in Lancaster County PA. If you witnessed this event or captured it on video please fill out an official fireball report. From Earleville MD on the beach it looked like a ball the size of the biggest full moon you have ever seen so clear and huge almost looked like it was going straight in the water! A few seconds later a boom, most amazing thing ever! I have been trying to see if any locals caught anything on surveillance or even local weather cams. I have been following the reports, having experienced it i am very intrigued. When you filter down to us that heard the sound after it dissipated it is interesting that the people on the right of the Elk River saw it one direction and the people on the other side saw it the opposite way, wouldn’t you conclude that this was the center point of where it was centralized? I am telling you we were so close it was like fireworks were being set off right in front of us. I have been posting in many areas surrounding us including WBAL tv to have people check their surveillance cameras, I am convinced it literally happened right in front of us. What are you basing the fragments in Lancaster? Is there not any satellites that monitor and see these things? Off to the left from us accross the water is Aberdeen Proving Grounds, there has to be some Surveillance from there! I got a glimpse of this, or I assuming it’s this fireball from Jamestown, Ohio and everyone told me I was just seeing things because they missed it. Saw a huge fire like object from Southern CA that was a fiery blue with an orange tail heading south towards earth. It wasn’t moving horizontally like a shooting star, but traveling vertically (south). Caught a brief glimpse before it disappeared. This appeared around 1:00am PST.